Recorded at the Jazz Café in Camden just before Christmas LIVE CHAMPS! opens with their finest song; (Never Stop Building) That Old Space Rocket and the tone is set for a night of quality Americana and Country music; full of harmonies, pedal-steel, slide guitar, big fat bass licks and cool drumming alongside Wilson’s warm and lived in voice. The first of their back catalogue appears with Cold, Cold World from 2008 and it stands comfortably, alongside the latest songs; perhaps because the tightness of the band shines through and ‘Free Jazz’ Jeff Widowson’s electrifying sax solos do the song no harm at all. Of the older songs here I’d genuinely forgotten how much I’d liked The Colonel and the King (about Elvis and Col. Tom Parker) and again; new life is breathed into it here. When we get to Darlin’ Won’t You Come In From The Cold it appears slower than I remembered; but that gave me the opportunity to hear some lyrics that I’d originally missed. Always as sharp as a tack, articulate and witty Danny surpasses himself with the chorus “You will never be too cool for school/the school for cool is for fools.” Sheer genius I say; genius! The album rolls along nicely with Danny introducing songs in his inimitable charming style; and thankfully the chat is kept to a minimum leaving us to hear the songs in all of their crystal clear passionate glory. Halfway through side 2 we even get to hear the little known and seldom heard 45rpm single You Don’t Know (My Heart is in the Right Place) which sounds uncannily like Graham Parker and the Rumour in their earlier days; perhaps it’s the mix of saxophone and pedal-steel; but it’s a damn fine sound. The album ends with These Days during which Wilson forgets the lyrics! By this time of the evening it sounds like the whole audience were cutting a rug. 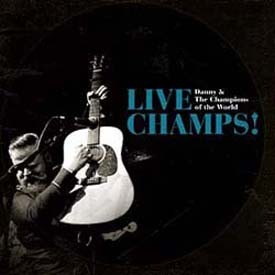 Danny and the Champions of the World – CHAMPS LIVE! What’s not to like?